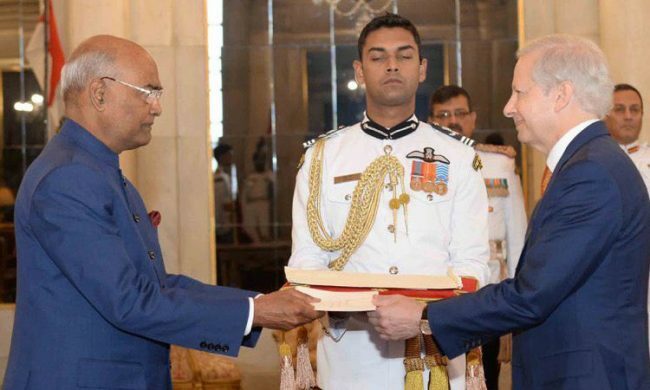 New United States Ambassador to India Kenneth I. Juster has presented his credentials to Indian President Ram Nath Kovind yesterday during an official ceremony at Rashtrapati Bhavan. Ambassador Juster will make his first official trip next week to Hyderabad, where he will take part in the 2017 Global Entrepreneurship Summit from November 28-30. Mr. Juster brings with him over 35 years of experience as a senior business executive, senior law partner, and senior government official. Mr. Juster recently served, from January to June 2017, as the Deputy Assistant to the President for International Economic Affairs and Deputy Director of the National Economic Council. He was a senior member of both the National Security Council staff and the National Economic Council staff. Prior to that, Mr. Juster was a Partner and Managing Director, from 2010-2017, at the global investment firm Warburg Pincus, where he focused on a broad range of issues, including geopolitical risk, global public policy, and regulatory matters relating to the Firm’s investment activities and portfolio companies. Mr. Juster served as U.S. Under Secretary of Commerce from 2001-2005, in charge of the Bureau of Industry and Security. In that capacity, he oversaw issues at the intersection of business and national security, including strategic trade controls, imports and foreign investments that affect U.S. security, enforcement of anti-boycott laws, and industry compliance with international arms control agreements. Mr. Juster holds a law degree from the Harvard Law School, a Master’s degree in Public Policy from the John F. Kennedy School of Government at Harvard, and a Bachelor of Arts degree in Government (Phi Beta Kappa) from Harvard College.